Wild Stoves supply equipment for efficient outdoor cooking on wood. They run workshops on efficient burning of wood and sell equipment at a number of festivals over the summer. They wanted to be able to provide electrical power for the festivals they attend, but wanted all the equipment to be portable, all parts to be moveable by one person and to fit within a specific space (within a Land Rover). As we had already worked with them to provide a smaller solar power system for their beautiful 50’s caravan, they came back to us for this project. 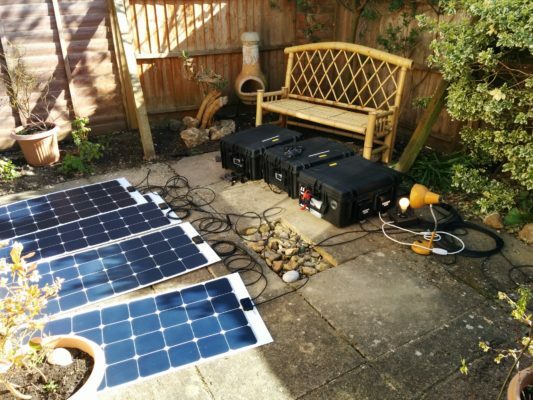 We were asked to produce a portable off-grid power supply system running fully on renewable energy. Together we designed a modular system which could be taken apart and connected together in minutes for easy set-up and operation. The final system comprised of three power boxes (two battery units and one control unit) and two 400Wp semi-flexible solar PV arrays. Due to the very bespoke nature of this project, this required frequent communication with the client. The battery units use Lithium Iron Phosphate (LiFePO4) batteries which have great energy storage density and are around a third of the weight of equivalent lead-acid batteries and are a proven failsafe Lithium technology. 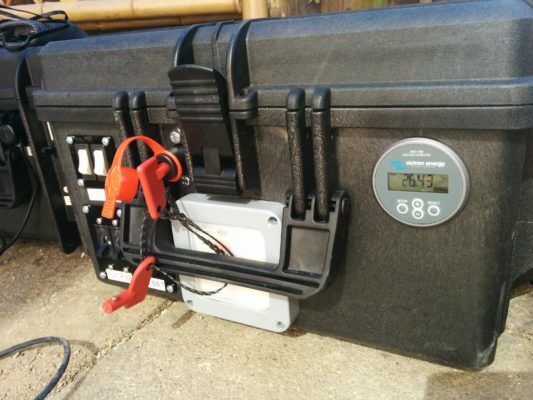 The total energy stored is 4.8kWh, enough to cover the power needs for a long weekend event. Correctly rated battery fusing and heavy-duty power connectors have been used. The control unit contains a 800W Victron Phoenix 24V Sine-wave inverter (to supply 240V AC loads) and a maximum power point tracking charge controller. The PV arrays are plugged into this unit. We also included BMV-700 battery state-of-charge monitor (to effectively monitor the batteries while in operation) and controls for different load outputs (so the external load can be switched off, while leaving the local loads kept running). All 240V AC outputs are protected by RCDs along with a ground-rod. The PV arrays are four 100W 12V nominal modules in series to make a 100W 48V nominal array. These are semi-flexible, so they can survive the knocks that occur when taken to different events. They are also much lighter than framed glass PV modules. The boxes are connected together via high-current Anderson connectors and thick cables. The two battery boxes link to the control box. This system will be used by Wild Stoves at a number of festivals they visit. They will be powering lighting, sound systems and battery recharging systems. 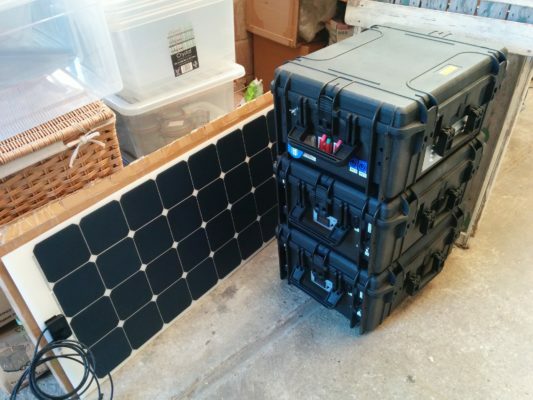 The complete 800Wp system, including PV modules, batteries and inverter, fits into the back of a Land Rover (along with two children!) and can be moved and set-up by one person.